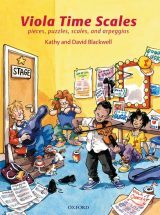 Kathy and David Blackwell have published over 60 books for young string players with Oxford University Press, including the progressive repertoire and technique books of the Fiddle, Viola, and Cello Time series, and books of pieces for junior string ensemble. 2018 is the 20th anniversary of the first publication of Fiddle Time! Click here for news of this celebration and a free piece. Piano accompaniments or teacher/pupil duets for some of the keys found in Viola Time Scales, plus accompaniments to a couple of pieces.